These types of cleaners contain an active ingredient known as sodium hypochlorite (a.k.a. bleach). 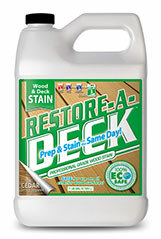 Most bleach deck cleaners also include other surfactants that assist in wood cleaning. Bleach alone is only an average cleaner at best of dirt and grime. It is however, a superb remover of mold, mildew and fungal growth. Although bleach does have its place for cleaning certain surfaces, wood may not be one of them. Bleach has been flagged as damaging to wood. It attacks the wood’s lignin, which is the organic substance that helps bind the fibers, cells, and vessels of the wood. In other words, it breaks down the composition of the wood and may cause drying, cracking and splitting. Sodium percarbonate is found in oxygenated type cleaners and does not contain bleach. This active ingredient is an EPA registered mold and mildew remover and is found in the Restore-A-Deck cleaners. 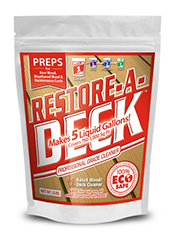 In addition, oxygenated deck cleaners include supplementary surfactants that assist in boosting the total effectiveness of the cleaner. 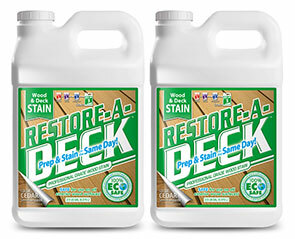 Cleaners like Restore-A-Deck cleaners are effective at removing mold, mildew, dirt, gray wood fibers, and in some cases failing semi-transparent stains. These cleaners are both environmentally and user-friendly as well as very effective. 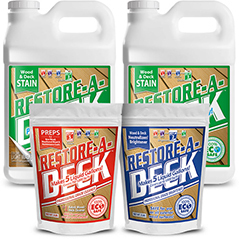 Sodium percarbonate cleaners can also be used for cleaning concrete, lawn furniture or as an effective house wash. When it comes to bleach vs. 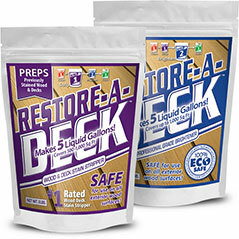 Restore A Deck Cleaners there really is only one winner. 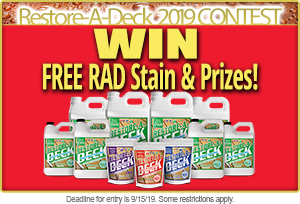 Although bleach deck cleaners may do a fairly decent job of cleaning dirt, mold, and mildew the long term damaging effects are not worth the risk. 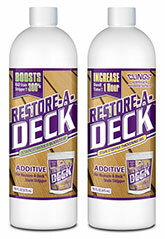 Restore A Deck Cleaners are safe, effective and will not damage wood. 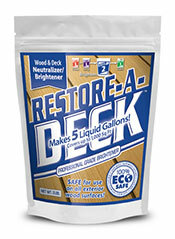 Why can't Restore-A-Deck Step #2 (brightener) just be left on the deck without a rinse? What would happen if you didn't hose it off? Exactly how long should it be left on before rinsing? Seems to me it would be better to let it penetrate completely until dry. If you leave the Brightener on without rinsing, you may leave the wood in "acidic" state of less then 7 on the pH scale. This in turn "may" create a reaction with the stain you are applying, leaving it streaky. Best to leave the brightener on for 10-15 minutes. It neutralizes very fast. Then rinse well for 20 minutes when done.